This boar bristle and nylon mix brush is best for normal to thick hair, with 6 rings of pure bristle and nylon tufts to stimulate blood flow to the hair roots. The density of the bristles allows conditioning sebum to be more evenly distributed from the roots to the ends of the hair. Mason Pearson Brushes Bristle/Nylon Handy is rated 4.9 out of 5 by 14. Rated 5 out of 5 by louised1987 from It is worth the hype! I was a little sceptical spending so much on a hair brush, but finally plucked up the courage in 2018 to purchase one. I have very thick, wavy hair that is prone to frizziness. 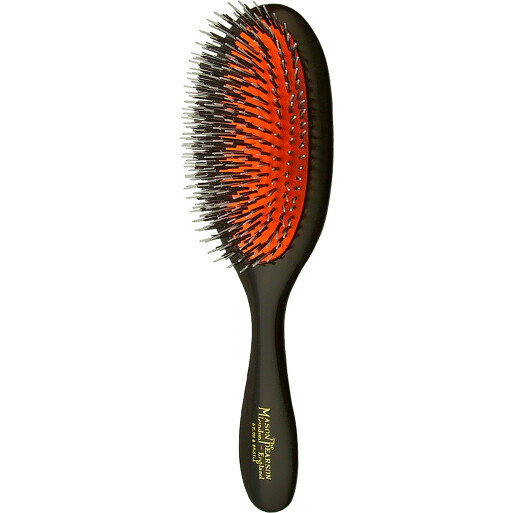 The Mason Pearson hair brush gently detangles whilst brushing and I have found it to smooth down any frizziness. It also doesn't cause static. I wash the brush twice a month using a little fairy liquid. I love my hair brush and wish I bought it sooner! Rated 5 out of 5 by Merrylegs from Hairbrush Present for my granddaughter, the best thing since slice bread, does what it says, her hair looks so much better, shiny, long and smooth, she has loads of compliments. Worth every penny. Rated 5 out of 5 by Pigface from Pink Mason Pearson hairbrush I scoured the internett for a pink Mason Pearson brush of the size I wanted. They seem as rare as hens teeth. Escentual produced it at a very good price. Fantastic service it arrived within a couple of days beautifully packed. Would certainly use them again. Rated 4 out of 5 by Lolz from Lovely quality brush This is a superb quality brush, after years of using cheap ones! I bought it in pink so nice girly colour, and the Handy size is perfect for my just below shoulder length hair. I must admit I need to get in habit of regular brushing, for now, I feel it can make my hair a bit greasy as it distributes the oils down the hair, but I think I just need to get used to it and it will be fine.